Infrared thermometers are useful for both diagnostic and predictive inspection of electrical systems and equipment. Used in electrical maintenance for over 30 years, infrared non-contact thermometers allow you to quickly gather important temperature information. Because electrical currents generate heat, temperature monitoring is an efficient way to predict potential equipment failure. 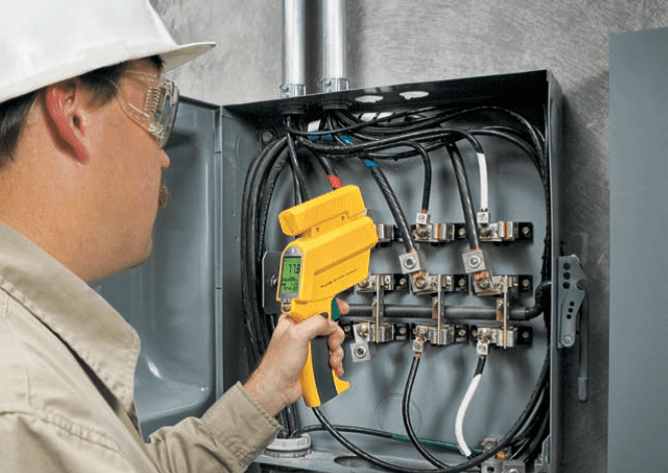 In one survey of electrical service and maintenance personnel, 100 % of those using infrared thermometers reported preventing thousands of dollars of downtime and repair expenses through detection of hotspots. In fact, insurance companies are encouraging their customers to implement preventive infrared scanning. Fluke infrared thermometers provide precise readings with 0.75 to 2 % accuracy, and from as far away as 35 feet, depending on the model used. They require no set-up and demonstrate a response time of less than a second. These instruments are lightweight, rugged, and easy to use. Non-contact infrared thermometers measure the surface temperatures of an object from a safe distance. Since an infrared thermometer measures surface temperature, accurate results are obtained only when the target is directly visible. Remove covers and enclosures to expose the object to be measured. Motors and oil-filled transformers and circuit-breakers can be measured directly because the surface temperatures of their enclosures generally correlate to the internal temperature. Make the following applications part of your comprehensive preventative maintenance program to prevent equipment failures and unscheduled down time. Normal on/off current loading and environmental temperature changes result in repeated heating (expansion) and cooling (contraction) of connections. Over time this can gradually loosen the connector. Because the loosened connector has higher resistance to current flow, it dissipates power and, as a result, generates heat. Similarly, dirt, carbon deposits, and corrosion in connections also cause higher resistance. When evaluating connections, it is important to know the temperature differential between the connector and the ambient temperature. If ambient temperature is unknown, it can be quickly determined with the non-contact thermometer. Increases of 10 ˚C (18 ˚F) from ambient temperature indicate a poor connection, ground in circuit, or unbalanced load. Most experts agree that a temperature reading of 30 ˚C (54 ˚F) or more above ambient indicates a serious problem. Industrial plants often have hundreds of polyphase motors in operation. To ensure a motor’s life span, temperatures must be monitored to verify balanced phase-to-phase power distribution and proper operating temperatures. 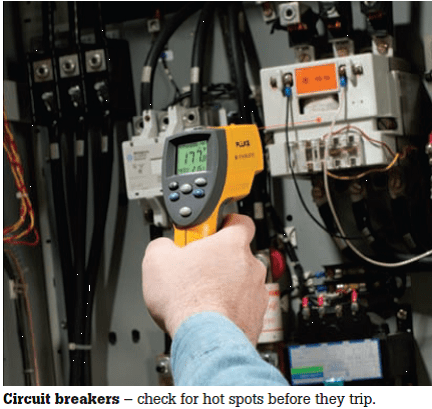 NEMA, the National Electrical Manufacturers Association, recommends a ± 1 % power balance to prevent damage or motor burn-out, and the IR thermometers can be used to inspect supply power connections and circuit breakers (or fuses) for equal temperatures. Heat is generated when bearings break down, causing the motor to vibrate and become off centered. 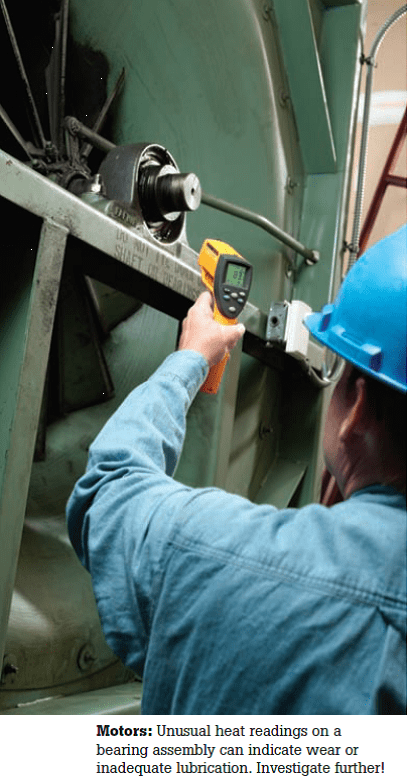 Scanning bearing temperatures with an infrared thermometer allows the maintenance engineer to detect hot spots and schedule repairs or replacements before the problem leads to an equipment failure. Studies by electrical maintenance professional have shown that winding surface temperatures are typically 10˚C (18 ˚F) cooler than internal (motor surface) temperatures. Certain standard test procedures, such as the IEEE “Meg-Ohm” test for motors 50 horsepower and above, require knowledge of the motor’s temperature to obtain accurate results; in such cases, the instantaneous digital temperature display of an IR thermometer is invaluable. IR thermometers are also effective in determining the source of the problem when a thermal overload protection device does not work and the motor shuts down. High-voltage, three-phase power circuits are common in industrial electrical systems. This is of importance to induction motors, large computers, and other equipment, which require balanced phase-to-phase power. If the power balance is not maintained due to an overload or ground in the circuit, damage and downtime can result. Checking cables and connectors with non-contact thermometers for equal phase-to-phase temperatures will quickly show if there’s a difference of 5 ˚C (9 ˚F) or more, indicating a problem. Maximum permissible operating temperatures are usually listed on the transformer. The windings of air-cooled units can be measured directly with an infrared thermometer to verify overall temperature. Any hot spots indicate winding flaws. Wires and cables can be monitored with a non-contact thermometer to identify heat caused by cracks, corrosion, or deterioration. When comparing two cables, the one with the higher temperature is carrying the larger current. DC battery connections are susceptible to loosening and corrosion, which can create excess heat. Hot localized connections in the UPS output filters can be identified with an infrared thermometer. A cold spot may indicate an open dc filter circuit. Low voltage batteries should be checked with a non-contact thermometer to ensure proper connections. Poorly attached cell strap connections in a battery string may heat up enough to burn the posts. Aging electrical components cause lighting fixtures to overheat. Using an infrared thermometer can detect overheated ballast before it begins to smoke. Within the plant, infrared readings can quickly and costs effectively identify hot spots in connections, cable splices, transformers, and other equipment. Routine temperature audits will help prevent the enormous costs that result from equipment failures and system shutdowns. In the field, conducting electrical utility inspections means taking regular temperature readings of transformers, wires, and other components located high above the ground and in other difficult-to-access locations. Several Fluke models feature optical ranges of 60:1 because there is no greater, bringing many targets easily within reach. If you work in a petrochemical plant or refinery or other site where flammable gasses could be present, IR thermometers rated for used in hazardous locations, such as the Fluke 68IS or Fluke 574NI should be considered. Once you have made a temperature reading, how do you know when a true problem exists? The answer lies in a combination of the service or maintenance technician’s own experience with the equipment and the ratings provided by the manufacturer of the electrical components being monitored. Electrical equipment manufacturers usually list on the rating plate the maximum allowable temperatures. The National Electrical Code (NEC) also gives information on acceptable equipment temperature as well as operating temperatures for specific electrical components and equipment. To know more about non-contact thermometers, visit Fluke Corporation, India. For time to time electrical components must be checked and a device like this using infrared can scan the whole electrical system for damage and for those needing maintenance.